Campers ages 5 to 9 will love this fun and exciting look into the world of animals from big to small, and scaly to fluffy, and everything in between! Campers will spend the week exploring the diversity of wildlife, animal diets, habitats, enrichment, and even star in a camper-led animal presentation! 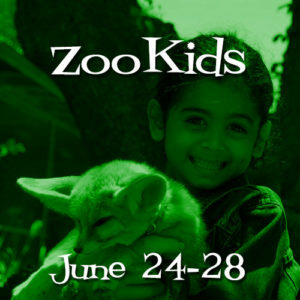 • Just $395 per camper and includes a WLC Zoo Camp t-shirt! Our friendly team of biologists is looking forward to hosting a fun, safe and educational experience! We maintain a minimum ratio of 1 biologist counselor to 10 campers at all times to keep the camp hands-on and interactive. At the beginning and throughout the camp, safety rules will be explained and enforced. Our expectations are simple and reasonable: respect the animals, respect your fellow campers, respect the counselors, and respect our neighbors. Campers will be expected to comply with the instructions of our counselors. If a child repeatedly disregards these instructions, a parent or guardian will be notified. If the camper continues to disobey instructions then in our sole discretion we can require that the child be withdrawn from camp. Under these circumstances, no refunds will be given. Campers will start the week off by learning all about the different species we have at the Wildlife Learning Center! They will get a chance to present one of our animals just like our staff does when we visit a school. Another day will be spent focusing on what animals eat– in the wild and at our Center. Campers will help us prepare diets, and then feed the prepared diets to our animals. Since kids love to get dirty, we have a whole day set aside for enclosure maintenance. They will get to go inside our animal enclosures and feel like a real zookeeper. With the help of our critters, campers will also create an animal footprint painting that they can take home as a souvenir. The week wraps up with a day learning about vet care and animal training! Campers will have an opportunity to groom a fox, feed a porcupine, go on a walk with a wildcat, and train a coatimundi!